From, Supernova 2006 - Weblog, for reference, a case study of incorporating Web 2.0 by Dresdner Kleinwort investment bank in Germany. Finally, some practical thought.. In Corporate eLearning Strategies and Development: Paper-based Learning - DIY Job Aids Brent takes a realistic look that sometimes good old paper based job aids and gives us some good tools. This is a sore spot for me as I try to sell including a 'paper based' take-away item in a training I'm designing. The overall training program is a highly interactive system training that includes videos, help systems, 'test-out' options, and practice environments. We've discovered a need for an easy 'take away' cheat sheet (something that can be attached to a monitor) so people can be reminded what menu to use for top tasks.. Many are so wanting virtual only training, that even the thought of a small reminder job aid to help during the transition is shot down. Never underestimate the power of the tangible item in your learner's hands. This article, Wikis at Work from Dice.com, asks us, could wikis work for you (at your workplace)? This is something I've been considering and looking for an opportunity to implement for a while. I plan to begin a log here into our deciding on and building a wiki collaboration platform here at my work. I am also planning to work on ways to publish and retrieve the contents through mobile devices, truly fusing mLearning and Web 2.0. When writing mLearning content, sometimes it is good to have a single URL that all your participants can access. The following are two scripts that you can add into the head content of your page that will detect a mobile browser and automatically redirect your users to a 'mobile friendly' version of your site. 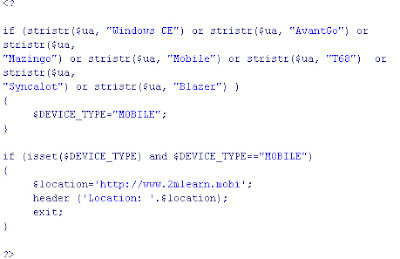 In this script, change the $location attribute to the page you want your users to see if they are using one of the mobile devices listed in the if(stristr.. string. This is a simpler script to detect Windows CE browsers (although you can detect any browser with this script.) Simply change the window.location URL to your mobile friendly site. to help all our visitors with mobile devices.